While prices for most precious and base metals have been subdued throughout 2018, there has nevertheless been a high level of mineral exploration around the world, as companies seek to fill the project pipeline before the next uptick in commodity prices. Here is a look at eight such companies and projects. The Abu Marawat concession spans over 738 sq. km and contains the Hamama and Abu Marawat deposits, plus the recently discovered Rodruin exploration project — all in an area that Aton says has “excellent” infrastructure, and is only 200 km north of Centamin’s large Sukari gold mine. Aton aims to expand resources at the Hamama and Abu Marawat deposits, continue its drill program at Rodruin, and carry out a regional target-identification program. It hopes to convert its exploration permit to an exploitation permit in 2019. In November, Aton borrowed $1 million from its shareholder Ou Moonrider, and granted it bonus warrants. Fortune Minerals (TSX: FT; US-OTC: FTMDF) is pushing forward with its vertically integrated Nico cobalt-gold-bismuth-copper project. The original Nico concept would see a mine and mill in the Northwest Territories that produces a bulk concentrate for shipment to a refinery, which the company may build in Saskatchewan. Fortune says the products at the refinery would include cobalt chemicals for high-performance, rechargeable batteries and bismuth metals and chemicals, as well as gold. However, in June Fortune said it had been approached by several global mining and refining companies interested in buying metal concentrates from the mine. Fortune says it is adjusting its Nico project engineering designs to allow flexibility to accommodate all of its downstream process options. In October, the federal and territorial governments accepted the environmental assessment approval for the Tlicho all-season road incorporating the modified measures developed with the Tlicho government through the “consult to modify” process with the Mackenzie Valley Environmental Impact Review Board. The Tlicho government also approved the board’s recommendation, with modifications. Glencore (LON: GLEN; US-OTC: GLNCY) has launched a $1-billion development program at its Craig nickel mine, which is part of the supermajor’s Sudbury Integrated Nickel Operations (Sudbury INO) division in Sudbury, Ontario. Named the Onaping Depth project, the mine expansion is designed to reach ore zones located 2,500 metres below surface, and is critical to the long-term sustainability of Sudbury INO’s operations in the Sudbury basin. Cementation Canada Inc. has been awarded the main contract to design and build the new internal underground shaft for the Onaping Depth project, with production from the new zones expected to begin in 2023 and go fully online by 2025. The 7.2-metre-diameter production shaft will be sunk from the 4,025 level of the Craig mine and measures 1.5 km horizontally from the Craig shaft. Cementation will engineer and build the hoistrooms and underground headframe, and is widening a 3-metre-diameter raise bore as a pilot raise for part of the final shaft excavation and construction. Glencore’s Sudbury INO employs 1,300 permanent employees engaged in exploration and other activities that include the Fraser mine, Nickel Rim South mine, Strathcona mill and Sudbury smelter. The company and its precursors have been mining nickel-copper ores in Sudbury since 1928, with facilities spread throughout the 60 km long Sudbury basin. Nickel and copper are the primary metals, but cobalt and precious metals, such as gold, silver, platinum and palladium, are also produced. Iamgold’s (TSX: IMG; NYSE: IAG) 64.8%-owned Côté gold project is located 20 km southwest of Gogama in Ontario’s Sudbury district, and is the subject of a newly completed feasibility study. As a base case, Côté now has a projected mine life of 16 years with mill throughput of 36,000 tonnes per day, at average annual production of 367,000 oz. gold and average annual production of 428,000 oz. gold over the first 12 years. 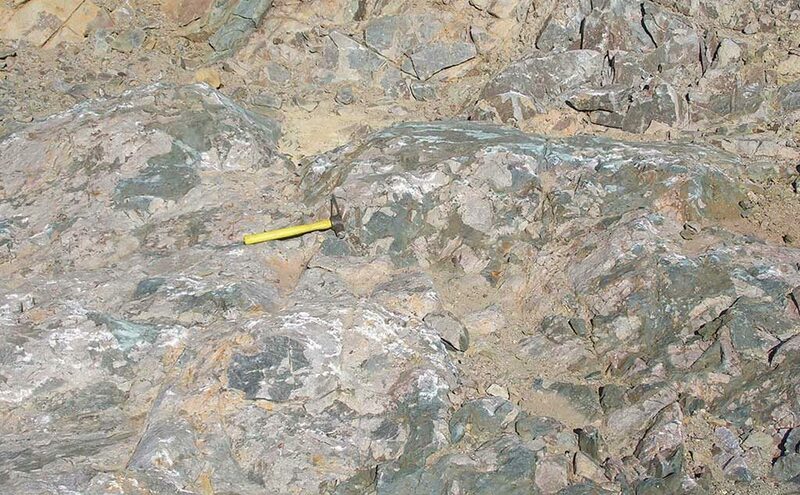 An outcrop at Iamgold’s Côté gold property in Ontario. Credit: Iamgold. The average head grade would be 0.98 gram gold per tonne; total cash costs, US$594 per oz. ; and all-in sustaining costs, US$694 per oz. gold. The after-tax net present value is US$795 million at a 5% discount rate and US$1,250 per oz. gold price. The after-tax internal rate of return is an estimated 15.2%, with a 4.4-year payback period. Initial capital expenses are pegged at US$1.15 billion. The feasibility study already includes plans for a two-year mine life extension. Proven and probable reserves on a 100% basis for the base case have risen to 203 million proven and probable tonnes grading 0.98 gram gold per tonne for 6.4 million contained oz. gold. Adding resources and the mine extension pushes the total number of contained ounces near 10 million oz. gold, on a 100% basis. Iamgold acquired the project through its friendly takeover of Trelawney Mining and Exploration in 2012, and Japan’s Sumitomo subsequently acquired a 27.75% interest. Toronto-based Probe Metals (TSXV: PRB; US-OTC: PROBF) led by president and CEO David Palmer and chairman Jamie Sokalsky — a former president and CEO of Barrick Gold, with Probe Metals having been formed as a spinoff after Probe Mines Ltd. was bought by Goldcorp in 2015. Goldcorp still owns a 13.7% stake in the Toronto-based junior. Probe is exploring for gold in Quebec’s Abitibi region, with its flagship being the Val-d’Or East gold project outside the city of Val-d’Or. 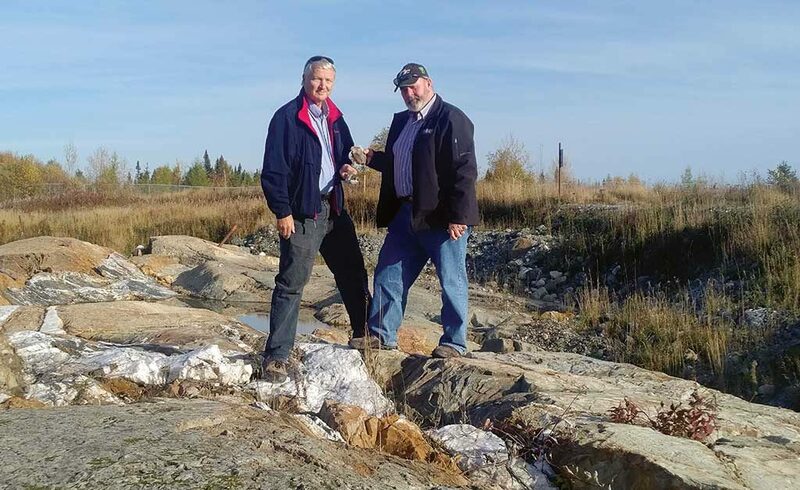 Probe Metals’ chairman Jamie Sokalsky (left) with director Gordon McCreary at the Val-d’Or east gold project. Credit: Probe Metals. Combining open-pit and some underground material, total indicated resources at Val-d’Or East stand at 9 million indicated tonnes grading 2.35 grams gold per tonne for 682,400 oz. gold, plus 9.3 million inferred tonnes at 2.41 grams gold for another 722,100 oz. gold. Probe’s exploration budget for 2018 was $12 million, with plans for 85,000 metres of drilling for resource expansion and discoveries, plus engineering studies, environmental baseline studies and regional target generation. Last year’s drilling campaign totalled 83,000 metres. In November, Probe said it had made “numerous new discoveries surrounding the past-producing Bussiere mine” located 1.5 km west of its Pascalis gold trend, including a near-surface discovery grading 3.3 grams gold per tonne over 11 metres within a larger zone of 2 grams gold over 22.4 metres, located 200 metres west of the Bussiere mine. 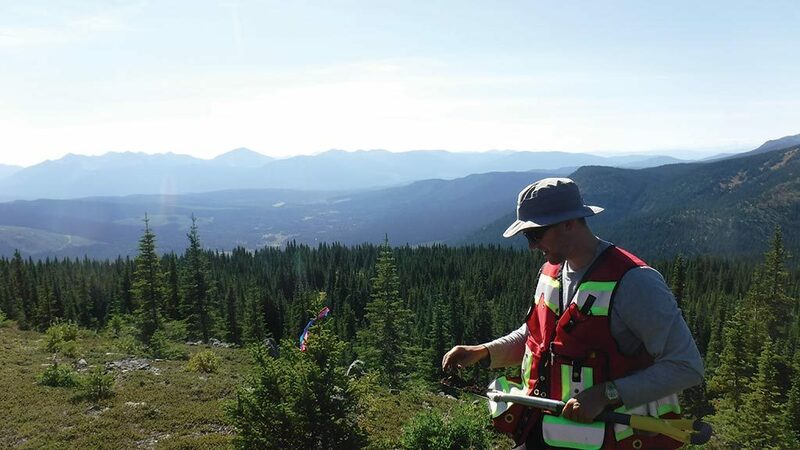 Vancouver-based Sun Metals (TSXV: SUNM; US-OTC: SMTTF) is advancing its flagship Stardust copper-zinc-gold-silver project in north-central British Columbia. Sun Metals describes Stardust as a “high-grade, polymetallic, carbonate-replacement deposit with a rich history,” with the deposit’s Canyon Creek copper-gold skarn zone being the subject of a 2018 resource estimate. A soil sampler at Sun Metals’ Stardust project in British Columbia. Credit: Sun Metals. Indicated resources at Canyon Creek stand at 985,000 tonnes grading 1.34% copper, 0.62% zinc, 1.59 grams gold per tonne and 36.8 grams silver per tonne, or 2.92% copper equivalent. Another 2 million tonnes at slightly lower grades lie in the inferred category. From diamond drill hole 18-421, drilled more recently at Stardust, Sun Metals cut a 100-metre intersection grading 2.51% copper, 3.03 grams gold and 52.5 grams silver for a 4.99% copper equivalent. Pursuant to an option agreement between Sun Metals and Lorraine Copper Corp., Sun Metals has an option to earn a 100% interest in the Stardust project by making annual installments of Sun Metals common share and cash payments. Sun Metals must also spend $6 million before 2022.